The report From Environmental Challenge to Sustainability Catalyst was created to help Tetra Pak by highlighting the possibilities and advantages in protecting food in a more sustainable way, and showing that packaging can play a crucial role in shrinking the carbon footprint of the food supply chain. Packaging is an environmental hazard. Packaging waste is filling up our landfills. When burned, it pollutes our air and contributes to climate change. These types of statements are what you can expect to hear when you ask consumers how they feel about food packaging. The environmental concerns are dominated by the perception that packaging material is bad for the environment. Looking at the food packaging industry today, there are clearly some more complex trade-off that’s create the overall environmental impact of products and packaging. Getting to the bottom of these questions can be very challenging. Sustainia helped Tetra Pak in communicating that the function of food packaging challenges the view of packaging as a bad thing. Packaging protects, preserves and prolongs the shelf-life of food so that it reaches the end consumer in good condition and thus helps limit food waste, which is one of the greatest environmental challenges of our time. From this perspective, packaging plays a vital role when it comes to improving the sustainability of the food supply chain as a whole. 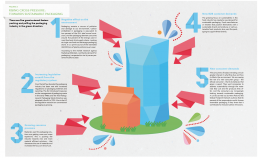 Sustainia helped communicate complex issues such as this in an engaging and easy to understand approach for Tetra Pak.